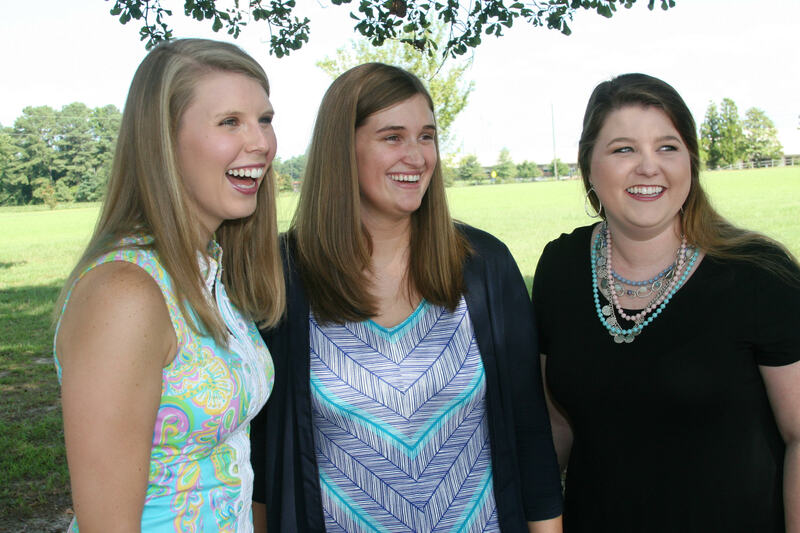 Katelyn Thomas, Morgan Barbour and Taylor Craig are using lessons they have learned through agriculture to educate and positively impact others. From the moment Katelyn Thomas, Morgan Barbour and Taylor Craig arrive at the Lee County Center for N.C. Cooperative Extension, it seems like a family reunion. After catching up on the comings and goings back at North Carolina State University, where the twentysomethings graduated not very long ago, they bounce from one topic to another. Until they somehow swerve into this. Which seems like just another moment of levity, except nobody stops to laugh. They just nod in agreement and start to move on. Wait, not so fast! You mean someone actually said that before? “Oh yes!” comes the unanimous reply. And, sure enough, a quick Google search pulls up research published in June saying that 7 percent of Americans hold that misunderstanding. When you mention careers in agriculture, most people think immediately about farming, but these women are taking their expertise in other directions. If their work has anything in common, it’s educating people — providing the kind of professional and practical knowledge that, apparently, is sorely needed. As the conversation drives forward, Katelyn explains how she helps farmers increase productivity and protect their investments as a sales associate for Bayer Crop Science, an international company producing seeds and pest control products. In many ways, it’s still a groundbreaking job for women. She’s the only one in her company’s Southern region and often runs across people who underestimate her expertise and tenacity — something they clearly do at their own loss. As events manager for the Sanford Area Growth Alliance, an economic development agency, Morgan isn’t working an obviously agricultural job. But she incorporates agriculture into a local leadership development program and uses the area’s farm assets — local producers and consumer markets — to help attract new investment and jobs. When discussion shifts to how important it is for people in an increasingly urban culture to learn the broader lessons of agriculture, Taylor mentions how she plans to get a chapter of the National FFA Organization up and running quickly at South Asheboro Middle School. She moved into agriculture education this summer after three years handling communications for the NC State College of Agriculture and Life Sciences, and is driven by the desire to help young people experience an “a ha” moment where they understand how much agriculture influences their lives. This conversation was planned for no more than 10 minutes, just a quick chance to touch base after a group photo. But as it moved well past half an hour, it was still going strong. One of the things most striking was their passion for agriculture and the people they serve. Another was their sense of confidence and composure. And, oddly enough, all three believe those personal skills grew directly from their experience in agriculture. Morgan and Taylor met in college as state officers for North Carolina FFA, both serving as vice president, and say the organization focuses on teaching “soft skills” that are essential for success. As things start to wrap up, the women get fervent again, this time about how important it is for farmers to tell their story — to clearly and accurately explain why agriculture remains so important. And, in their own different ways, that’s exactly what they’re out to do. Editors Note: This article is the seventh in a monthly series highlighting the impact local women are making on Lee County agriculture. The series, which is expected to run through November, has been developed through N.C. Cooperative Extension in Lee County. Articles can be found on the left side of this page or at the links below as they are released.